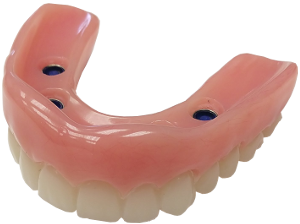 Overdentures received their name because they are a denture that goes over something else. The denture can sit on top of teeth, retained roots, retained roots with mechanical attachments, or implants with mechanical attachments (see video to the right). Millions of people wear dentures every day and most will tell you that their upper denture stays in place quite well. Upper full mouth dentures form a seal with the palate and quite literally suction into place. The lower denture is a slightly different story. The lower denture covers less surface area than its upper counterpart. It is horseshoe in shape and sits on the ridges that remain after extractions. In addition, the tongue lies right in the middle of the denture. When one speaks and eats, the tongue moves. This movement can often cause the lower denture to move. Although one can learn to adapt to this movement and even use muscles in their mouth to hold the denture still, another great option is the implant retained overdenture. If you have lower denture and a qualifying boney and tissue foundation, you may be a great candidate for implants. Locator abutments attached to the implants allow a mechanical attachment between the implant and the lower denture. This attachment prevents denture movement, aids in more efficient chewing, and increases one’s confidence that the denture will not fall out. Come in and see models of exactly how this treatment can change your life.